LTG (R) Randolph W. House epitomizes the core values of leadership and commitment to service evident here in the Corps of Cadets. Upon his graduation in 1968 as a distinguished military graduate, earning a degree in Agriculture, House also received his Army commission. After serving two tours as a combat infantryman in Vietnam, he received his masters degree in Industrial Education from Clemson University. House has commanded in peace and war at every level of command from an infantry platoon commander in the 82nd Airborne Division through Deputy Commander in Chief of the U.S. Pacific Command. 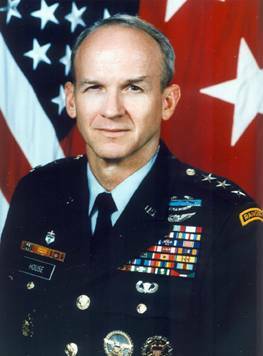 General House commanded the 2nd Brigade of the 1st Cavalry Division in Southwest Asia during operations Desert Shield and Desert Storm. In October 1998, he received a second three star assignment as the Deputy Commander in Chief and Chief of Staff of the U.S. Pacific Command. General House retired after almost 33 years of service in December of 2000. His military decorations include that of the Defense Distinguished Service Medal (with two oak leaf clusters), Distinguished Service Medal, Silver Star, Distinguished Flying Cross (with three oak leaf clusters), Bronze Star Medal (with an oak leaf cluster), the Vietnamese Cross of Gallantry (with two silver stars and two bronze stars) among many others. He currently serves as a consultant to the Army regarding operations in Korea. He also assists the Dean of the George Busch School of Government and Public Service a strategic study to determine how the Bush School can attain “Great School” status by the year 2010. House is a former member of the Board of Directors of USAA, he has been active in the Corps Development Council, Corps of Cadets Association, the Association of Former Students and President’s Council.